Locals call Medellín the "city of the eternal spring." The capital of Colombia’s Antioquia Department is second only to Bogotá in terms of size, but there are just as many opportunities for culture and adventure as there are in the nation’s capital. Use this guide to help find the best Medellín has to offer. Located in the Aburrá Valley, Medellín is cradled at the base of mammoth green Andes in the Cordillera Central mountain range. The second largest city in Colombia, this metropolis is home to some 2.5 million people, known colloquially as Paisas. These residents are renowned for their biting humor and endless merrymaking. The city itself was founded in 1616 in what is today the tourist-heavy and affluent neighborhood of El Poblado, located in the south. The Our Lady of Candelaria of Medellín church still stands and dates back to 1675. Other remnants of the Medellín's colonial past can be found in the city center. 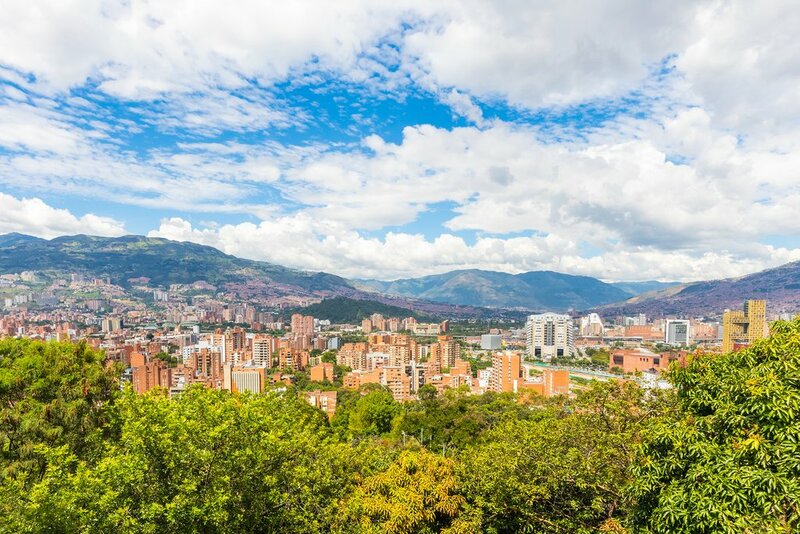 Because of Medellin’s temperate climate, no special injections or vaccinations are necessary. Yellow fever is not present here, nor is malaria. Your visa is good for three months, but it’s a quick and straightforward process to get an extension at the immigration office in the city. Note that foreigners can't spend more than 180 days in Colombia in any calendar year. ATMs are ubiquitous in Medellín, and most establishments accept cards. Still, advise your bank and credit card company of your travel plans in advance. Locals like to dress up for a night out, so it's a good idea to bring one nice outfit and shoes if you are planning to hit the town. Unlike Bogotá’s high location in the Andes, Medellín’s lower station at around 4,900 feet means altitude sickness is rarely an issue. New arrivals might get a little winded walking up steep, hilly sidewalks, but major health issues are unheard of. 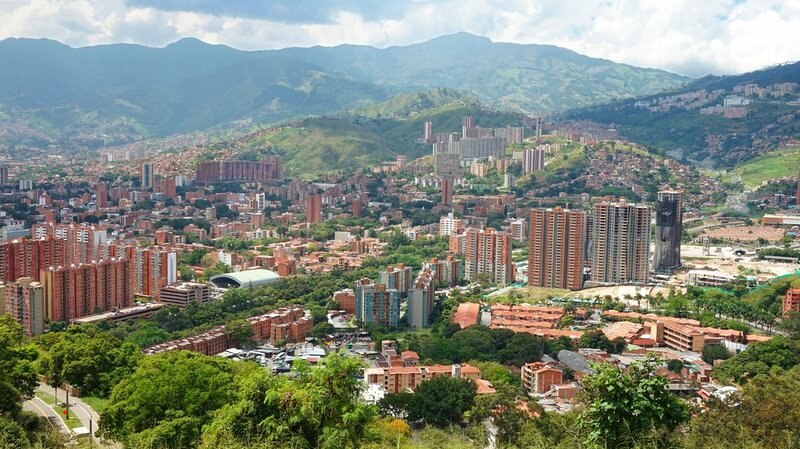 It’s Medellín’s perfect altitude that creates the conditions necessary for an average temperature of 75°F year round. You can get away with shorts here during most days (and even nights), but it’s good to pack long sleeves and pants for more formal occasions or the infrequent chillier times. Be sure to pack an umbrella as well, as scattered showers occur on a regular basis. You'll need at least three days to experience the best attractions of Medellín. However, if you want to take in all the sites, as well as explore some of the pristine Antioquian countryside that surrounds it, add two or three more days to your itinerary. The days of mustached drug lords ruling the streets of Medellín are long gone. It’s a perfectly safe city now—especially in the southern neighborhoods of Poblado and Envigado. Still, the city center can be a dodgy place, especially after dark when it is teeming with prostitution and petty crime. Also, with foreign tourists comes the drug trade. It’s not uncommon for tourists to be approached by drug peddlers, especially in trendy Poblado. Just remember that although cocaine is ubiquitous in certain areas here, it is still illegal. And you don’t want to find yourself on the wrong side of the law. The best times to visit Medellín are when the city holds one of its famed annual festivals. You can expect the partying to reach raucous levels. Here's a list by month of the most special events. Semana Santa: the traditional holy week is a big to-do in most places in Colombia. In Medellín, you’ll see plenty of impressive religious processions. Festival Internacional de Tango: Argentina’s most beloved tango musician, Carlos Gardel, was killed in a plane crash in Medellin in June 1935. This festival was first held in 1968 in honor of his legacy, and is the largest Tango event in the world outside of Argentina. Events including lessons and performances happen all over the city in parks, streets, and public buildings. Feria de Flores: This is one of the most famous and impressive festivals in the entire country. 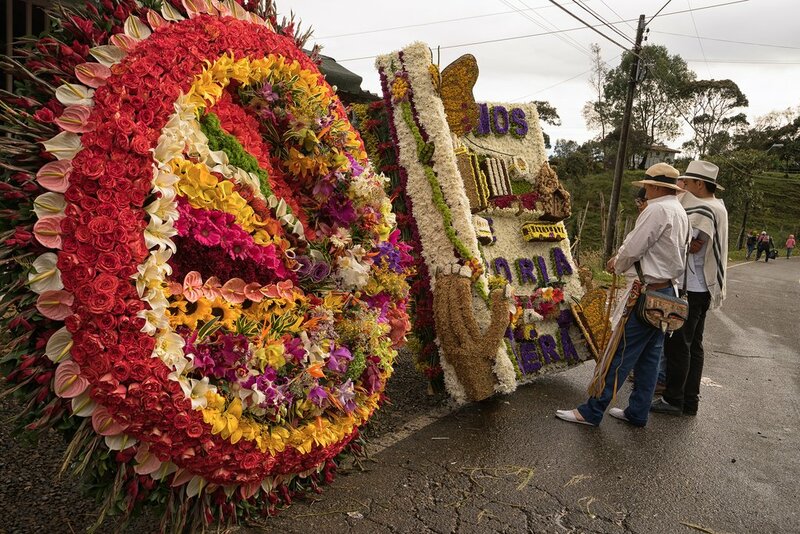 During the first two weeks of August Medellín celebrates its fertile Antioquian grounds as flower harvesters strap great floral displays to their backs and parade down the streets of the city like proud peacocks. Concerts and street parties are ever-present at this time. Festival International de Jazz: Foreign and local bands and free concerts. Christmas: It's a month-long event in Medellín, and the festive spirit carries over into November and January as well. Street parades take place on the major thoroughfares, like Avenida Oriental, and Christmas Eve is a raucous celebration when family and friends party in the streets, drink, and play music until dawn. Activity in the Botero Plaza. Sculptures by Fernando Botero. The options for culture and entertainment in Medellín are many. 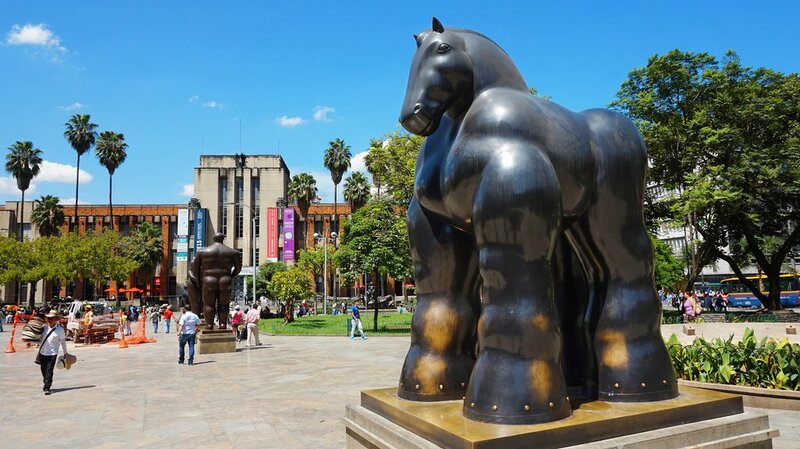 The first recommendation is to stroll the various parks and plazas of the city center, such as Parque San Antonio (great for people watching), and enjoy the Rubenesque sculptures on display in Plaza Botero, named after Medellín’s most famous artist, Fernando Botero. Then consider taking a ride on Medellín's modern Teleferico (electric gondola) up to the hillside barrio Santo Domingo. From here you'll have spectacular panoramic views of this beautiful city. Once you've covered the main sites of Medellín, you can embark on a number of excursions outside of town, such as visiting Guatapé and El Peñol. For more ideas on what to do around Medellín, check out this article or consider one of these great day trips. Here in this 14-hectare botanical garden, visitors are treated to some 5,500 species of trees and plants. Stroll past lily-filled ponds and the pathways will lead you ultimately to the star of the show: the Orchideorama. In this 65-foot display, wooden tree-like structures ascend to a mesh canopy that catches rainwater, protecting the orchids on display as well as the attendant butterfly reserve. It's located at Calle 73 #51d-14, just north of the city center. Parque Lleras in Poblado is the place to go for a night of dancing, music, and excellent restaurants. If you find this area too touristy, head for Calle La Treinta y Tres, which attracts more middle-class locals. Notable bars and discos on this long drag of revelry include the beer-heavy Public House, dance-happy La Rouse and the intimate Le Café. While salsa music is big here, it isn’t the only style in town: tango is also a huge part of the paisa culture in Medellín. For some true tango spirit, be sure to visit Salón Malaga, an institution in the city center. The owner, Don Gustavo, has amassed a great collection of tango memorabilia that he’s strewn about his bar, which also features live music and tango shows. The region of Antioquia is known for its breathtaking beauty: muscular Andes peaks and rolling green hills dipping down into fertile valleys with running rivers. You can see it all from the seat of a paraglider. Most flights last between 10-30 minutes and fly over not just the surrounding countryside but the city itself. Flights are open to beginners. Travelers at the Jóse Maria Córdova International Airport of Medellín. Medellín's Jóse Maria Córdova International Airport is located some 40km from the city. Most flights connect in Bogotá, but budget air carries like VivaColombia make flying in and out of Medellín an inexpensive affair. There are regular shuttles (minibusses) that run from the airport to the city center. 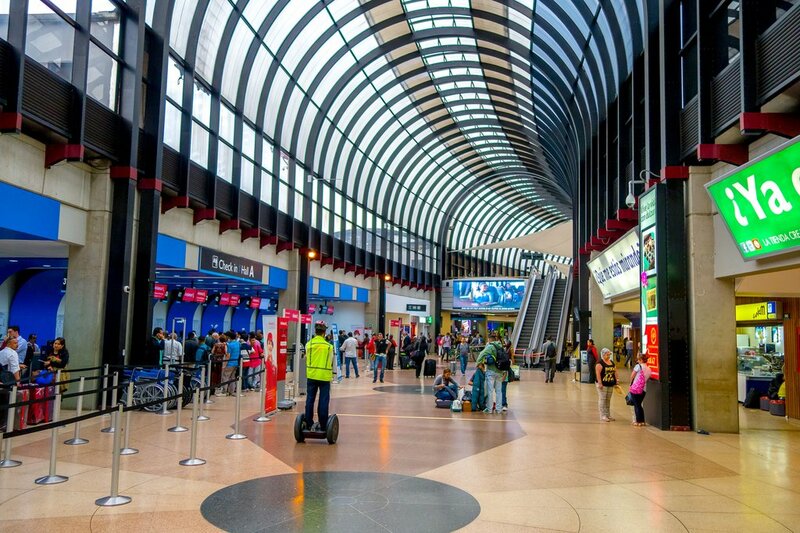 There are also two bus terminals in the city: the northern terminal, Terminal del Norte, is located north of the city center, at the Caribe metro stop, while the Terminal Sur is located near the El Poblado metro station in the south. 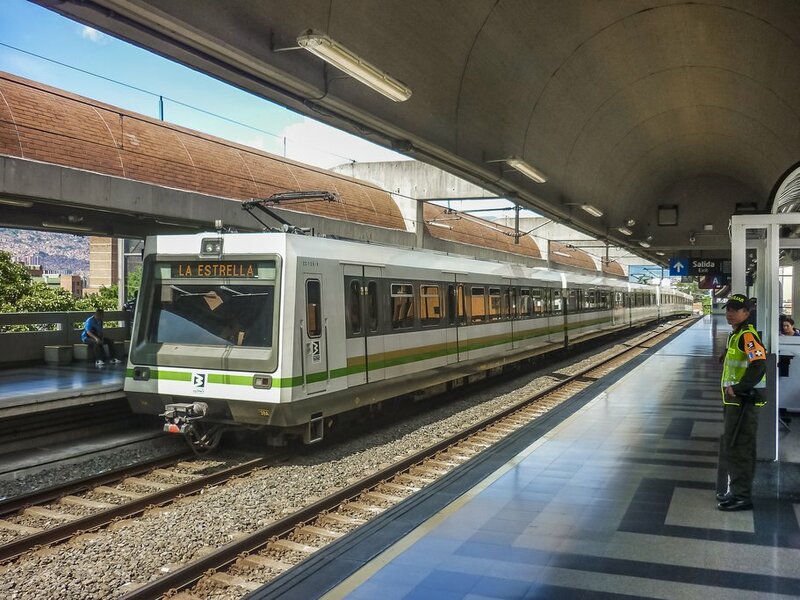 The Medellín metro system is the best way to cross the city. It wouldn’t be a trip to Medellín without enjoying the city’s famed metro. The system of modern trains, gondolas, and express buses is efficient and inexpensive. You can reach either end of the city in 30-60 minutes. Uber is available (but Lyft is not), so make sure you have downloaded this app before arriving. Note that Uber is somewhat controversial in Colombia. For the most part this isn’t a problem; however, if taking Uber to or from the airport, know your driver's name and avoid mentioning the app to avoid causing issues for your driver. Taxis are still a solid option for public transport in the city. They’re relatively cheap and can be found on most street corners. Taxis here are metered, but sometimes you can negotiate a set price with the driver for transport to/from a certain location. New hotels and trendy hostels are popping up all over the south of the city, where most foreign visitors come to stay. There’s something to be said for this, as neighborhoods like Poblado and Envigado are often safer and are closer to restaurant zones and nightlife options. For ideas on cool places to stay in Medellín, check out the best boutique hotels in the city, along with this roundup of reliable family-friendly hotel options. Typical Colombian food from the Medellin area, known as Paisa Bandeja. Poblado is the best place to go for a great meal, with everything from taco stands and Japanese-run ramen joints, to charming tea cafes and high-end restaurants. The area around Parque Lleras is positively abuzz on weekend nights, making for a great environment to dine out and enjoy a few drinks. Popular options in the area include the elevated, contemporary cuisine of Carmen, the multi-sensory gastronomic delights of trendy El Cielo, and the Mexican/Costeña fusion fare at Milagros. For some true Paisa fare head over to Mondogo's and try the namesake dish, a thick soup made with tripe and vegetables that is beloved by Colombians. Alternatively, if you want to take a gastronomic vacation out of the country, try the Thai food at Royal Thai near Parque Lleras. 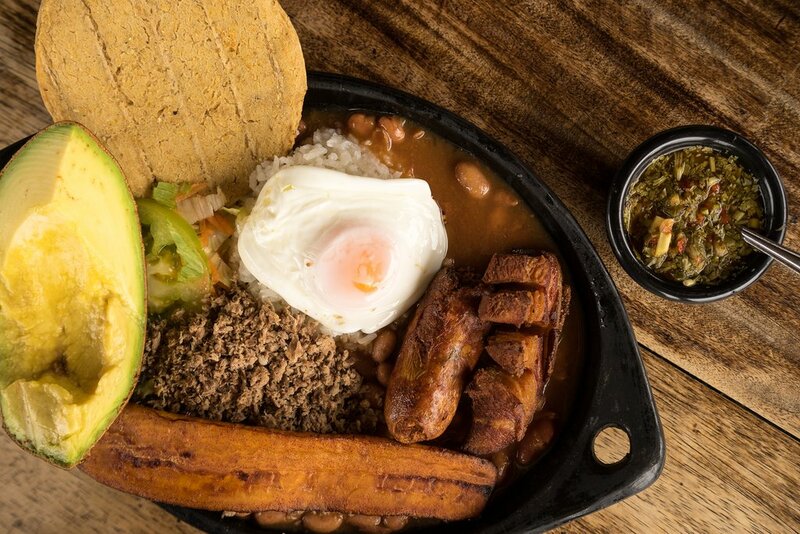 Or you could leave Poblado and head to the city center and restaurant Hacienda, where you can enjoy a bandeja paisa—a local dish featuring a mountain of pork, beans, rice, and topped with a fried egg. It's a formidable culinary challenge. For more options on where to dine in the city, check out this article. Travelers with kids in tow will want to read Where to Eat with Kids in Medellín, and the café scene is worth getting to know as well (Pergamino Cafe in Poblado is particularly noteworthy).